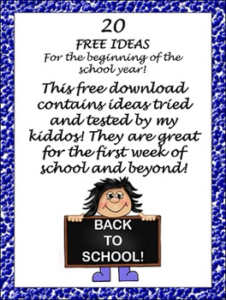 This free download is a list of ideas to get your year off to a great start! I have compiled a list of 20 activities that I use during the first few weeks of school – some of these can be repeated many times through out the year as well. It also includes a list of the 10 books that I like to read in the first weeks of school. Please note – this is not a product. This is a compilation of ideas that I have gained in over 20+ years of teaching. Any materials needed will most likely already be found in your classroom. There are directions for a self control activity, a team work activity, alpha ball game, first day feelings activity etc….for a total of 20! This is a .pdf file. Click HERE for more Back to School Products and Freebies!